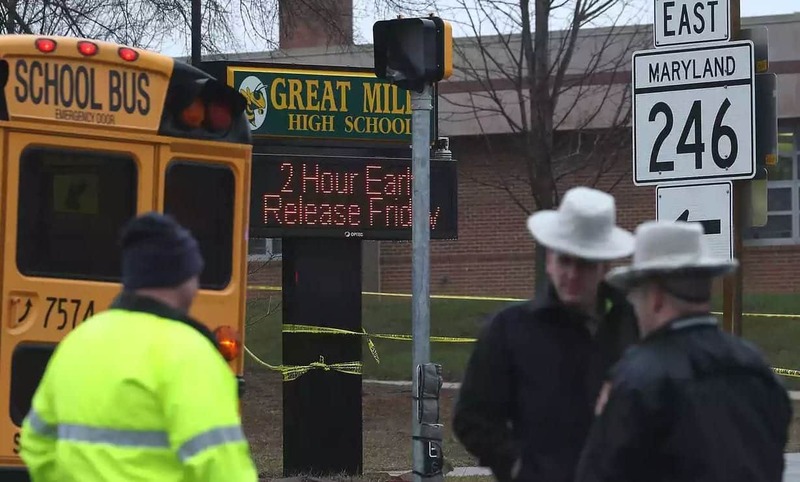 Three people were critically injured in a shooting at Great Mills High School in Maryland on Tuesday morning. A student reportedly “pulled a gun out and shot” a female student and a male student, according to NBC4. St. Mary’s County Sheriff Tim Cameron also said the shooter exchanged gunfire with the school resource officer. The shooter was injured, while the officer was not. NBC4 reports that “all three students are in critical condition.” ABC7 obtained audio of a call about the injured students, which said two of the injured were “priority one” patients with “head injuries.” A “priority two” patient had “a leg injury,” according to the audio. In a statement, the school district said that “the event is contained.” The identities of the injured were not released by authorities, nor any information about the shooter or their intentions. The school has since been put on lockdown and students are being evacuated from the campus, according to The Baltimore Sun. Great Mills has about 1,600 students and is 90 miles outside the city of Baltimore. This entry was posted on March 20th 2018 at 12:01pm/12:01 and is filed under Live News Column 1, Politics, Social Issues, Society/Culture, Terrorism. You can follow any responses to this entry through the RSS 2.0 feed.